Will Nokia's Windows Mobile affiliation put the brakes on HERE Auto adoption? Mobile phone maker Nokia has unveiled a new cloud-connected in-car multimedia platform, known as HERE Auto. Key features include turn-by-turn nav, cloud connectivity providing features like real-time traffic and sychronisation with external devices like smartphones. HERE has hitherto been Nokia's mapping and navigation subdivision. To find out more, read our review of the Nokia HERE app. The new announcement both expands the HERE project and marks Nokia's entry into an exciting if competitive new market. In-car technology is currently experiencing a period of explosive innovation. Nokia's plan is clearly to get in on the action and sell its new HERE Auto platform primarily to car makers. Several companies, including Harman, sell technologies and services that are then integrated into in-car systems by auto manufacturers. In-car infotainment is increasingly complex and few if any car makers do the whole job on its own. Instead, they do some in-house, buy in other modular components and then hook them all together in branded package or platform, for instance BMW iDrive or Audi MMI. So does HERE Auto have what it takes to get a share of the fun? 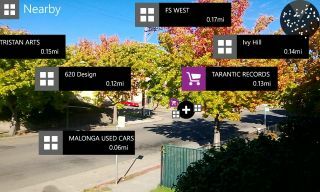 There's nothing immediately unique about the mix of mapping, internet connectivity and device syncing offered by HERE Auto. So much will depend on the quality of execution. Nokia says, for example, its HERE Traffic feature has been radically improved by a new processing engine known as 'Halo'. It's claimed Halo offers a compelling mix of weather, traffic congestion, road construction and other data to give drivers the best possible routing. Sounds, good, but perhaps the real test will be features like device syncing and local search. Given that Android and iOS devices dominate the mobile market, can Nokia – currently wedded to Windows Mobile for its own smartphone offerings – really offer something superior. Likewise, can Nokia really compete with Google for local search services? Time will tell. Or perhaps it won't. Should Nokia win over any car manufacturers, it's not guaranteed that the installation of Nokia HERE will be clearly advertised at the point of sale. If your latest model has Google Search, it's a no brainer to make a fuss about it. But will car be be bothered about – or even aware of – Nokia HERE? In that context, Nokia probably has a tough task convincing car makers to allow HERE Auto to jump on board.